After succeeding in her quest to achieve support in Canada for her ‘Inter-Allied Poppy Day’ scheme, and after sending Colonel Moffat to Australia and New Zealand (possibly South Africa too), Anna Guérin next looked towards Great Britain. The mention of the Prince of Wales is not as far-fetched as it might sound because it had been reported that Anna had performed for members of the British Royal Family during her tours within Great Britain, 1911-1914. Given her powers of persuasion and charm, she was more than capable of achieving a personal audience with HRH Prince of Wales – in his role as Patron of the British Legion. But who knows? The British Legion was formed from four national organisations on 15 May 1921:- Officers Association; Scottish Federation of Ex-servicemen; the Comrades of the Great War; and the National Association of Discharged Sailors and Soldiers. HRH Prince of Wales became its first Patron, Earl Haig became its first President. “Royal” became part of the title in 1971. Prior to that, around August 1920, Earl Haig had began his Fund to aid ex-service men. Having sent Colonel S.A. Moffat off to Australia & New Zealand; and having left her sister Juliette and her friend Blanche in charge of all the arrangements in Canada, Anna left for England. It was on 29 August 1921 that Anna arrived in Liverpool, from New York. On SS Albania’s Passenger List, she was described as a “Lecturer”. Her age was given as “40”, but she was really 43. 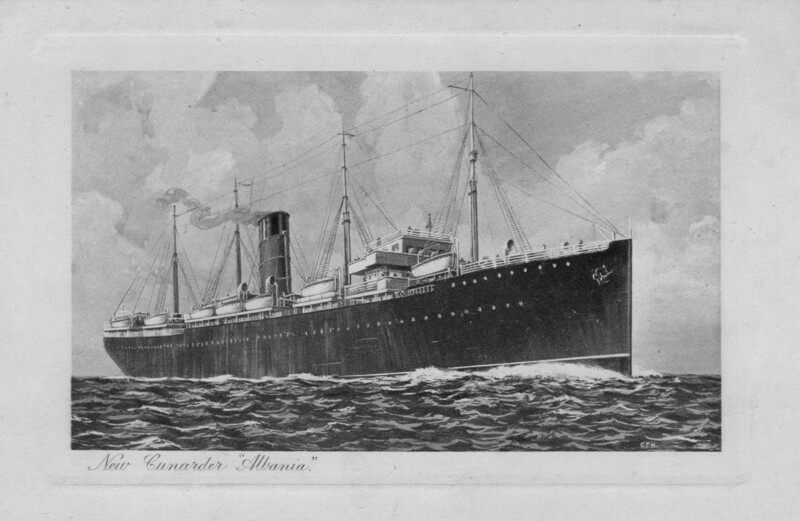 ‘SS Albania’: This was the ship that brought Madame Guérin into Liverpool, 29 August 1921. Courtesy of Heather Anne Johnson. It would appear that Anna wasted no time, once she had disembarked. She must have boarded a train immediately and travelled south. 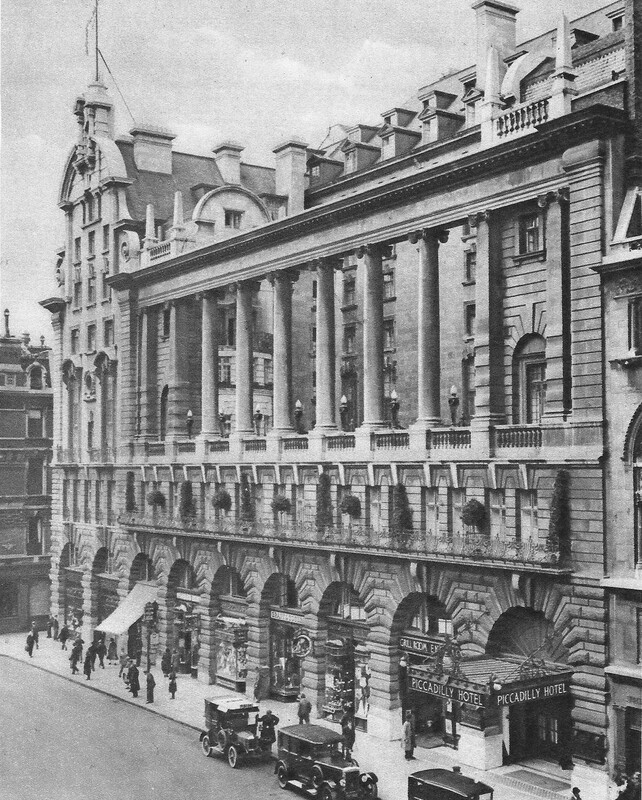 Her proposed destination shown on the ship’s Passenger List was the Piccadilly Hotel in, significantly, Regent Street, London. Poppy Lady Madame Guérin stayed at the Piccadilly Hotel, Regent Street, London. Courtesy of Heather Anne Johnson. Once in London, Anna Guérin visited the British Legion headquarters at No. 1 Regent Street – along from her hotel. Whether she had sent a cablegram to them from Canada, ahead of her arrival, or HRH the Prince of Wales had put in a good word for her … is not known. In her Synopsis (1941), Anna Guérin described going to London after Canada “where the English Veterans’ Organisation was in the great need”. There must have been some prior contact though because, reportedly before her arrival, Colonel George Crosfield (who would hold the post of Legion Chairman 1927-1930) asked General Secretary Colonel Edward Charles Heath DSO if he would meet with Madame Guérin. 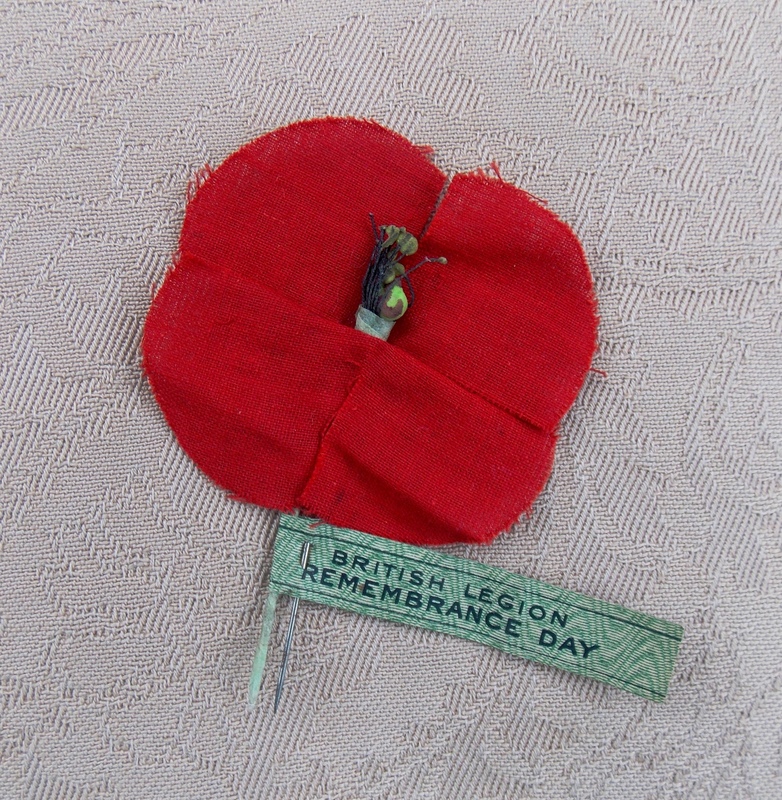 Anna Guérin showed the two British Legion men samples of her artificial poppies. She asked if they would consider adopting the remembrance poppy symbol. Anna Guérin wrote in her 1941 Synopsis [sic]: “Field Marshall Haig , the President , called a meeting where I explain the Idea which was adopted immediately , but they had no money in the Treasury to order their Poppies . It was September and the Armistice day in November. I offered them to order their Poppies in France for them , so my own responsibility , that they would paid them after . Gladly they accepted my offer . *Is Anna Guérin’s “Sir Francis” one Frances William Crewe Godley, who changed his name to Francis William Crewe Fetherston-Godley in 1923? He served in the First World War and became an OBE in 1918. He was not a Knight in 1921, when Anna Guérin was meeting British Legion men – he became a “Sir” in 1937. He was Vice-Chairman of the British Legion National Executive Committee 1932-34 and became Chairman in 1935. Or did she mean to write “Sir Herbert” (Brown) … or did both men go? Ahead of the 1942 Armistice Day, the Gloucester Journal (07 November) printed an article in the paper’s children’s column ‘Children’s Corner. Conducted by Uncle Charlie’ but it would have been thoroughly enlightening to any reader, regardless of age. It recounted that “The Poppy Day idea came to the British Legion rather mysteriously, and there were grave doubts at first as to whether it would “take on” …”. Included, was Colonel Edward Charles Heath’s version of Madame Guérin’s visit – from an issue of the Legion Journal:- “In the late summer of 1921, Col. Crosfield asked me if I would meet a Madame Guerin. This little French lady visited headquarters and showed us some small artificial ‘poppies’ of a type then being made by certain French women and sold for the benefit of children in the devastated areas of France. “The project was put to them. “Poppies! Who wants poppies? Madame Guerin – who is she? What are her credentials? Do the two French firms exist? Colonel Heath’s recollections present the British Legion as more cautious than Canada’s G.W.V.A. but perhaps that caution was based on having “no money”. The British needed to be sure of who they were dealing with. Madame Guérin’s offer of poppies before payment would have been welcome. She had done this before in the U.S.A., used her own money to help the cause. As Hon. Appeal Secretary of the British Legion, the significant contribution made by the aforementioned Sir Herbert in Great Britain’s adoption of Madame Guérin’s ‘Inter-Allied Poppy Day’ idea may never fully be known. Sir Herbert Brown, KBE (1869-1946), was the second son of Charles Brown and his wife Emily Dunn. Father Charles had founded the flour milling business ‘Charles Brown & Co. Ltd., in Croydon and Bermondsey. Eventually, Herbert became head of that company. He was very illustrious and successful. He forged strong links with hospitals in the area. He became Chairman and, then, President of the Croydon General Hospital – giving over £20,000 to the hospital, over time. He was a Governor of St. Thomas’ Hospital and Richmond’s ‘Star and Garter Hospital’. 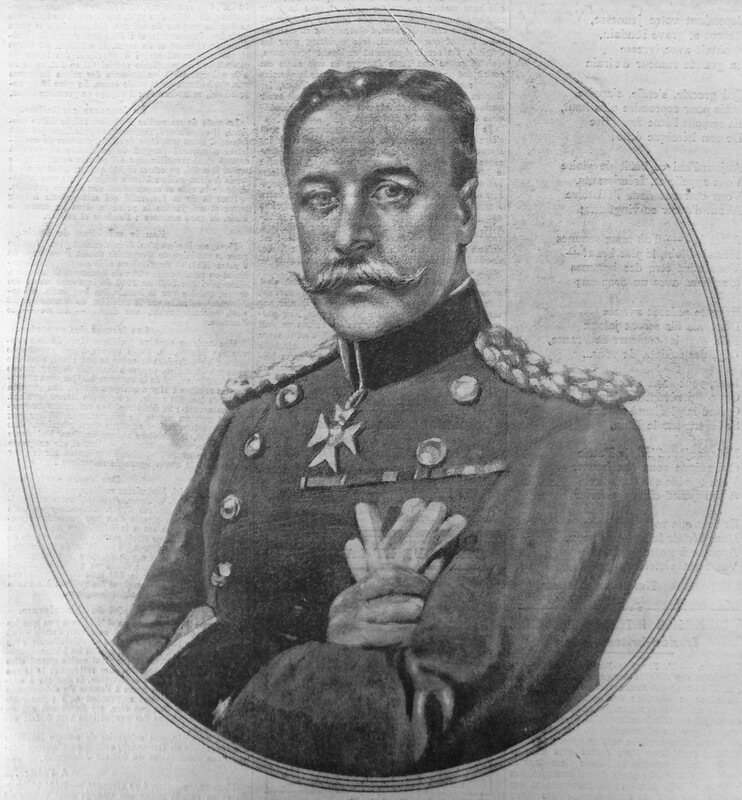 Herbert was knighted in 1920 and received the Cross of Officer of the Order of Leopold, of Belgium. Sir Herbert’s family was no different to many in Great Britain during WW1: for example, his sister had driven a Voluntary Aid Detachment ambulance and his son John Gordon had been killed by a sniper six days before the Armistice. For his second journey, it is wondered whether Sir Herbert Brown accompanied (for part of the way?) Lieut.-Colonel Crosfield, D.S.O. as he began a venture in France on 20 Sept. 1921: “War memories were revived by a scene at Victoria Station on Tuesday morning, when a party of nearly 200 ex-Service men, unemployed, and devoid of all trappings and pretensions of the soldier, left for Folkestone en route for France, to work in France’s devastated areas. The party was cheerful, and showed their joy at the prospect of at last securing employment, even though this might entail a lengthy sojourn abroad. Lieut.-Colonel Crosfield, D.S.O., vice-chairman of the British Legion, who accompanied the men, explained that work had been secured through the Legion’s French organisation. The work was largely unskilled, and the men would receive the trade union rate of pay in France of two francs (nominally is 1s 8d) per hour for unskilled work and 2.50 francs for skilled labour. By 16 September 1921, the British Legion had made its decision to adopt the poppy as the remembrance flower public …. on that day, the Evening Post in Wellington (New Zealand) reported that the Returned Soldiers’ Association was considering a proposal to “adopt the red poppy of Flanders as the national memorial flower, in accordance with the action of the American, Canadian, and English ex-service men’s organisations, …”. With the “English” being mentioned, does that mean that it was official that the British had made the decision? On 27 September 1921, it was reported in the Toronto Daily Star that the G.W.V.A.’s Dominion Command had received a cable notifying that Great Britain would wear the memorial poppy on the Armistice Day that year. Was that cablegram from the British Legion? If so, was it a courteous reply, updating the Canadian G.W.V.A. because they had sent a cable encouraging the British veterans to follow their lead? … as it is known the G.W.V.A. sent one to Australia. HRM Prince of Wales did become chairman of the British poppy campaign, jointly with Field Marshal Earl Haig. Haig let it be known that he desired that 11 November 1921 be known as ‘Remembrance Day’ and it would be a ‘Poppy Day’ … like no other flag day. The British newspapers’ promotional articles contained lines from Canadian John McCrae’s ‘In Flanders Fields’. It is wondered whether there was a conscience effort to omit the Guérin name from press releases because the name has seldom been found within these. Thus, in Great Britain, Madame Guérin was seldom publicly credited with originating ‘Poppy Day’ or mentioned in any other respect – the inference was it was Earl Haig’s idea. “Le général sir Douglas Haig”, ‘Excelsoir’, 17 December 1915. Courtesy of Heather Anne Johnson. Women, including those from War Service organisations and the British Legion’s Women’s Section, were called upon by Earl Haig “to give him just a few hours of their time”. 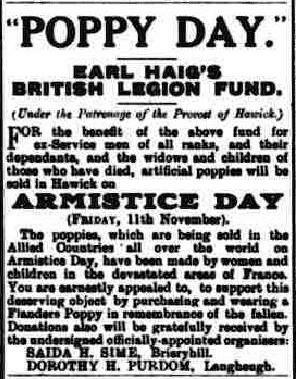 As Earl Haig had asked “earnestly” for the women “to help by selling poppies” on 11 November 1921, so did newspapers print “Local Helpers Wanted” articles ahead of Armistice Day. 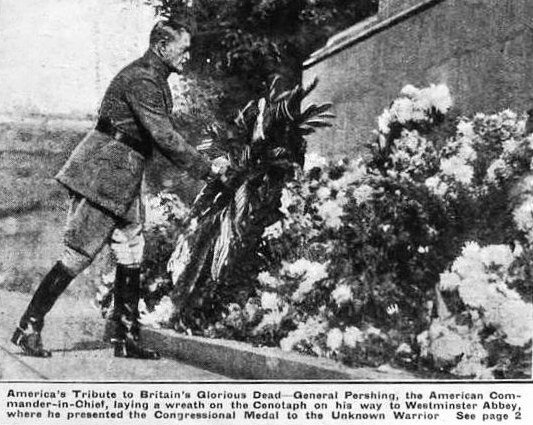 American General Pershing laying a wreath at London’s Cenotaph on 17 October 1921. 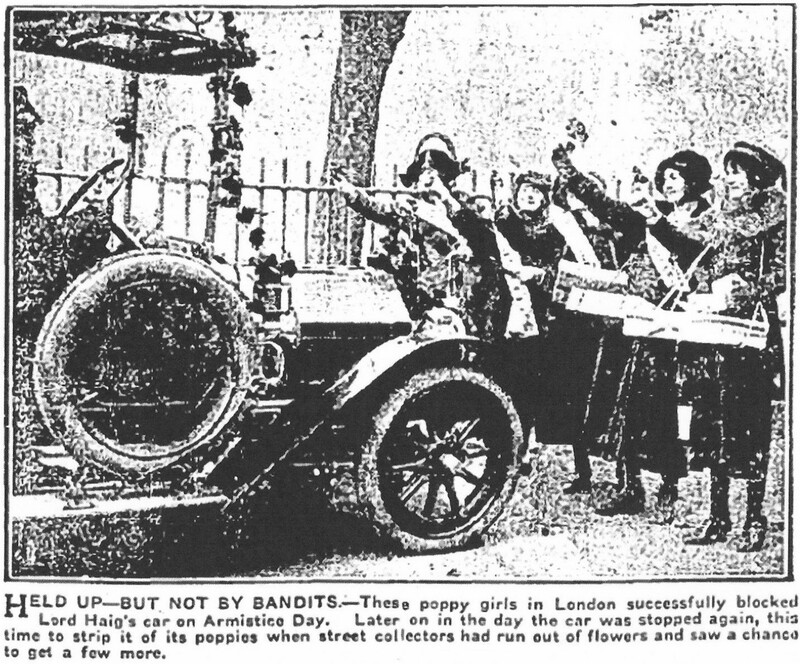 (‘The Children’s Newspaper’, c21 October 1921). Courtesy of Heather Anne Johnson. The photograph above shows General Pershing (Commander-in-Chief of the American Expeditionary Forces) laying a wreath at London’s Cenotaph on 17 October 1921. He was in London to attend a ceremony at the Westminster Abbey, where he laid the Congressional Medal on the tomb of the Unknown Soldier. The Duke of Connaught represented the King and Colonel Streatfield represented Queen Alexandra. Others present included: Lloyd George and some of his Cabinet colleagues; representatives of the British fighting services; and 500 American soldiers from the Rhine. Some of the American soldiers, plus 50 men from the American warship ‘Olympia’, formed a guard of honour at the Abbey. General Pershing arrived in a Royal carriage, with “members of his suite” and the American Ambassador Mr. Harvey. (Northern Whig of Belfast, 18 October 1921 acknowledged). “PREPARING FOR POPPY DAY IN DUNDEE. Owing to Poppy Day being announced so shortly before the event, Dundee was at first faced with a shortage of “poppies,” but matters have taken a different complexion during the past few days through the efforts of a large number of willing workers in the city. About the beginning of the week Mr. Robert Hansell, who is in charge of the Deaf and Dumb Institution, Lochee Road, offered the services of his staff to help the Corporation out of their difficulty, and his offer was accepted. The girls in the Institution are taught, as part of their training, to make artificial flowers, in which work they are very quick and skilful. They immediately set to work, and at the same time the teaching staff offered to initiate Dundee school teachers into the mysteries of poppy making. A similar offer in respect to private ladies brought a rush of willing helpers to the Institution, and the movement has grown steadily day by day. 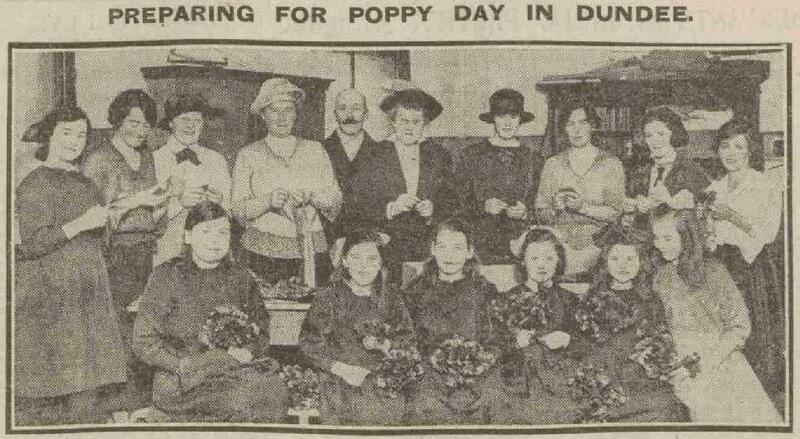 Large numbers of lady teachers are being trained in poppy manufacture in a room of the Cowgate School placed at the disposal of the organisers of the movement, and they in turn teach their pupils the art. Every day, too, numbers of ladies attend at the Deaf and Dumb Institution for lessons. Our picture shows a number of those ladies at work. All the workers take away the necessary materials to make poppies in spare moments, so that there is a constant deluge of poppies. The other day eight of the senior girls attending Harris Academy took a lesson in the art at the Lochee Road Institution, and yesterday many of the senior girls were busy increasing the total in school. Image © Johnston Press plc. Image created courtesy of THE BRITISH LIBRARY BOARD. Image reproduced with kind permission of The British Newspaper Archive. Hawick News and Border Chronicle – Friday 04 November 1921. During World War One, Sir Percy Fitzpatrick toured South Africa, lecturing about the war. His son Major Percy Nugent was killed at Bourlon Wood, nr Cambrai, Pas de Calais, France on 14 December 1917. After the Armistice, apart from the two-minute-silence, he conceived the idea of the National South African War Memorial at Delville Wood, Somme, France and he was Committee Chairman for it. “REMEMBRANCE DAY. The Two Minutes’ Silence. IMPRESSIVE SCENES. Unemployed’s Wreaths at the Cenotaph. The true measure of the public gratitude to our fallen heroes seemed intensified a thousandfold in the awe-inspiring an solemn stillness which encompassed the city and east Metropolis at 11 o’clock this morning. The throbbing pulse of the heart of the Empire ceased completely, and every business of every nature bowed its head in reverent homage to the sanctified dead. The observance of Poppy Day was not the least of the many Armistice anniversary celebrations. The movement was initiated by Earl Haig to obtain funds for disabled ex-Service men, and the public readily responded, sellers of poppies being besieged. There were impressive scenes in London streets. When the maroons were heard thre was an instant hush. All moving things in the thoroughfares came to a stop. Many women wept, and men stood silently and bareheaded during the two minutes. Reports from all parts of the country show that Remembrance Day was celebrated with all due solemnity and reverence. Field Marshal Earl Haig of Bemersyde: posing with his wife Countess Dorothy Maud Haig – promoting poppy sales on the first British Poppy Day on 11th November 1921. Courtesy/© George A. Webster Collection. The scarlet petals gave the predominating colour note to the streets, and it was the rarest exception to see the man or woman who did not wear Haig’s buttonhole, in remembrance of the red fields of Flanders. Earl Haig’s car, decorated from head to tail with poppy blossoms, flew from street to street, like the passage of a great Cardinal-bird. 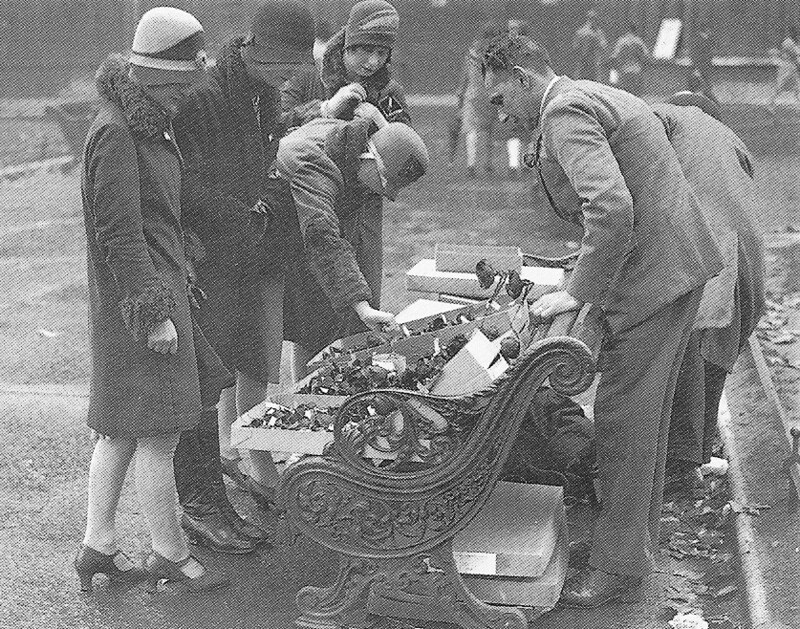 Princess Alice sold poppies outside Windsor Castle. A sale of curios at Sotheby’s was interrupted while a basket of poppies was put up for sale. Major Warre, M.C., who acted as auctioneer, purchased the basket for £10. The basket was put up again, and, after a series of sales, it realised a total of £100. Below: “This poppy and note from Field Marshal Douglas Haig was laid on the new Cenotaph built in London, on 11th November 1921”: Green Howards Museum. Field Marshal Douglas Haig’s 1921 Poppy. Courtesy/© Green Howards Museum. However, the types of poppy (and one particular purchaser) caused a little dissent. 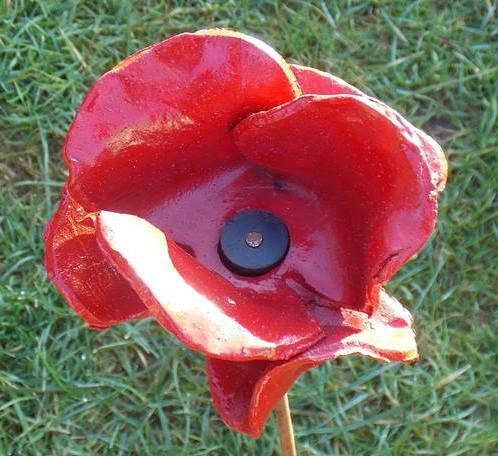 One poppy seller in Hull felt strongly enough to write to her local newspaper: “Sir. Why should there be a distinction between the silk and cotton poppies. I, one of the many collectors, think it is a very wrong idea. 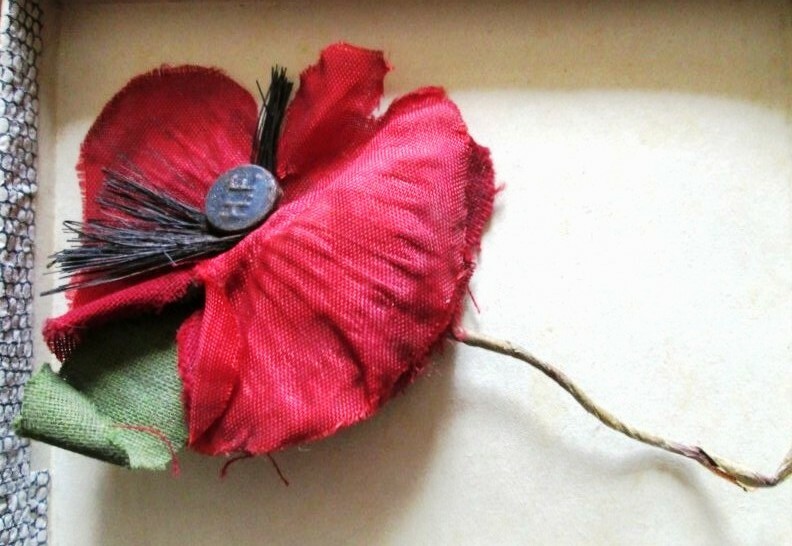 The poor man’s penny, given with a free heart (in many cases it is a struggle to spare) is belittled by the ones who wish their gifts to be advertised … many a working girl and man gave their silver, but asked for no distinction, whilst one with a haughty demeanour asked for a silk poppy. On being told that our stand had no silk poppy, he replied, “Very well, I will go to another stand where they have the silk flowers. …” Some people obviously felt that, to have the choice, was divisive e.g. the inference could be made, coppers for cotton poppies, silver for silk poppies. 1921 British Poppy : Madame Guérin’s cotton French-made Poppy – which was distributed on the British streets on 11 November 1921. Courtesy/© of Heather Anne Johnson. 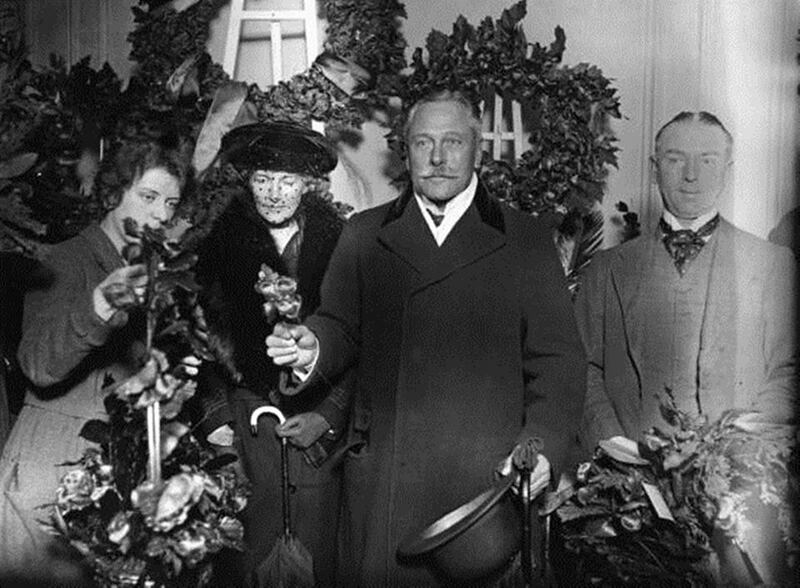 Madame Guérin’s poppies being distributed on 11 November 1921 – somewhere in Great Britain. Courtesy of Heather Anne Johnson. In the aforementioned children’s article, ‘Uncle Charlie’ wrote about the poppies sold: “A very large number (for those days) were sold on that November 11, and that first Poppy Day of 1921, under a scheme rushed through between August and November, achieved a total of £106,000.” By 23 November, the counting of the huge amount of cash collected in London alone had still not been completed by the bank and money was still pouring in. On 09 January 1922, in New Zealand, the Auckland Star Special Correspondent recounted some human stories from London’s two minute silence at the cenotaph: “The tense moments of silence were broken by one agonising cry, that could not be stilled, of a woman who sobbed on, the barriers of her restraint gone down utterly”. 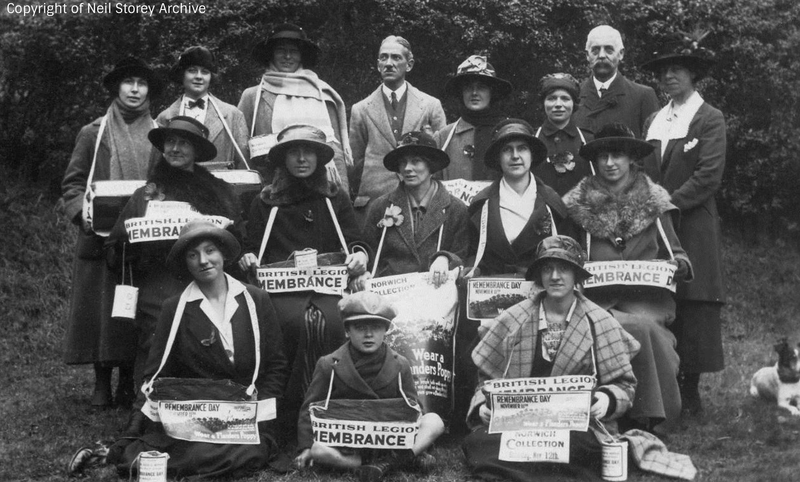 After the event, it was noted that the key role played by women in the distribution of the poppies, had more than justified the need for a British Legion Women’s Section – which had only been formed 01-03 August 1921. It is believed that Madame Anna Guérin must have imparted her organisational secrets to the British Legion because it followed a similar strategy to hers (N.B. From 1 October 2016, the Women’s Section of the Royal British Legion was absorbed into the organisation as a whole … ceasing to exist as a separate entity from that date). To the British Legion, their 1921 ‘Poppy Day’ was an unexpected and overwhelming success. One newspaper quote reads “No one could have foreseen how the idea was going to grip the public imagination as it did.” However, perhaps it must be said here that there was one person who knew just how successful it was likely to be … Madame Guérin herself! The Northampton Mercury looked back to Armistice Day 1921, on 5 November 1937 [sic]: “How many Northampton people who will be wearing a Flanders Poppy on Armistice Day are aware how the movement originated? In that year the emblems were made by the children of the war distressed areas of France, and £106, 000 was collected in various parts of the country. 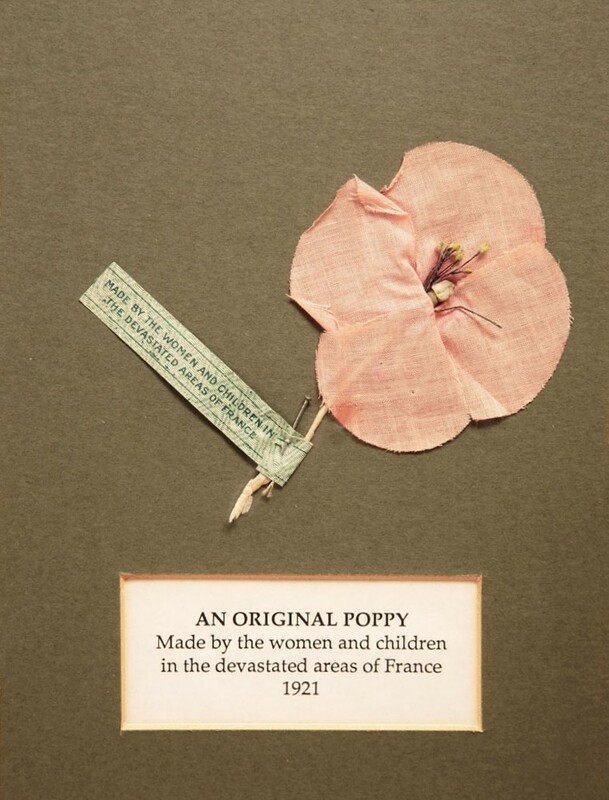 1921 Remembrance Poppy : One of Madame Guérin’s French-made cotton poppies (albeit faded) – distributed on British streets 11 November 1921. Courtesy/© of Poppyscotland. “TO-DAY’S BEAUTIFUL OBSERVANCES. HOW THEY WERE BROUGHT INTO BEING; AN ORIGIN WHICH IS LOST IN OBSCURITY. To-day we all paid tribute to our glorious dead. For two minutes a solemn stillness reigned over the whole kingdom, and the thoughts of all turned to those fields in Flanders where …. the poppies blow, Between the crosses, row on row. Then that impressive pause occurred there was a gathering of the noblest of the land in Westminster Abbey, standing with heads reverently bowed, doing honour to the memory of that Unknown Warrior who is for all of us the chosen representative of the thousands who gave their lives fighting by land, and sea, and air. And inside the Abbey, and everywhere outside, there was on the breast of every man and woman a red poppy. Each of these beautiful observances—beautiful in their simplicity, their silence and their significance—expressed for us all the thoughts which were too deep for words. We had cause to be grateful to the minds which gave birth to the idea of uniting our common feelings in such dignified and expressive symbolism. But, unfortunately, the authorship of the three ideas is not definitely ascertained. We do not know whom to thank. It has been claimed that a Margate vicar, the Rev. David Railton, who served as a chaplain of the Forces in war time, and who has buried many a fallen soldier, known and unknown, on the fields of France and Flanders, first conceived the idea of bringing home the body of an unknown warrior and laying it in a national tomb, beneath a slab of Belgian marble, Certainly he did make the suggestion of such a ceremony to the late Dean of Westminster (Dr. Ryle), and certainly he was the donor of the flag of Ypres which rests above the Unknown Warrior’s grave. But it was not on his representation that the authorities acted. The Dean of Westminster had received the same suggestion two months earlier from a woman, whose name has never been officially disclosed. There are those who ascribe the authorship of the idea to a French infantry man, Mons. Gaston Vidal, who fought in the Great War with the famous Alpine Chasseurs, and subsequently rose to a place in the French Cabinet. He had made the suggestion, “en passant,” in an article in a Parisian newspaper. It was taken up eagerly by the Union of ex-Combatants and the ex-soldiers in the Chamber of Deputies, but for some reason it was allowed to lapse. It was revived, though, when it became known that a similar proposal had been adopted in England. But there is an even earlier claim than that, and an English claim, too, Mr. Frank Stevens, of Abingdon, states that in July 1919, months before Vidal’s article was written, he had made the same suggestion in a letter to a London newspaper, whose editor, for some unimaginable reason, decided not to publish the proposal. In any event the germ of the idea is at least a hundred years old, and has probably an American origin. In the war of 1812 three men lost their lives in doing signal service on the frontier. The State, to do them fitting honour, sent a special commission to bring their bodies to Albany, and laid them in unmarked graves in the grounds of the Capitol. And to-day no man knows where they are buried. The originator of the Great Silence, too has never declared himself. But it is stated by some that the ceremony arose from a suggestion of Princess Louise, the Queen’s aunt. The proposal reached the ears of the King, by whom it was at once passed on to the Cabinet. Poppy Day came about through the imaginative enterprise of a Frenchwoman Mme. Guerin, who conceived it principally as a way of giving employment in the manufacture of artificial poppies to the women and children of the devastated areas of France. Mme. Guerin travelled through England, Canada, Australia and the United States to advocate her plan, and it was adopted in all those countries. It was Mr. J. H. Ziegler, of Noctorum, Birkenhead, to whom this noble epitaph occurred. R. A. M.
“… … Severe Food Shortage In England. “The soldiers are well fed. There is nothing they can want for in that respect. This is especially true of the American soldiers. The real food shortage is in England. I have seen women, with children in their arms, lined up for blocks early in the morning, waiting for the butcher shops to open. Usually the supply ran out before all got their allotments. While in England I could get no butter, no milk, no sugar, no sweets of any kind—the only things they have plenty of are eggs and potatoes, and eggs are 10 cents each. You are given ration cards that contain four coupons for each week. Each coupon entitles you to two ounces of raw meat or three-fourths of an ounce of cooked meat. Many families save a week’s coupons until Saturday and get a small Sunday roast with it—that is all the meat they have in a week. Whether you buy your meat at a butcher shop or eat at a restaurant you must have the coupons. Even tinned meats or sardines can be procured only in this manner. “Girls and women are all working—the men have all gone to the front. I have seen thousands of girl munition workers in one factory, turning out munitions for the allies, for England and France are capable of supplying ordnance and ammunition to all of the allied forces, including America. Women are handling baggage on the rail-roads, running the clerical work and thousands of other jobs that women never did before the war. “Then there is the women’s army auxiliary corps in France, which does the cooking, drives the automobiles and so on, many of them working under shell fire, but each one releasing a man for fighting duty in the front lines. There are the nurses , too, including hundreds of American girls, and ambulance drivers, where American college girls are also represented. The women are doing all of these jobs and doing them efficiently. Style Give Way to War. “Styles and parties and automobile rides do not concern the women of England and France any more. Their style is either a military uniform or a mourning dress, and when you see hundreds of women pass by and each one in mourning your thoughts intuitively go back to America, with her paint and powder and frills and fineries. “At night all lights are out—even in London and Paris, and if you go about you must carry a pocket flashlight to find your way—for there must be no signs to guide the German airmen on his mission of death. “Five air raids in London and one in Paris I went thru. and they were touch more horrible to me than anything I experienced on the actual front. Usually there is twenty minutes warning of an impending raid and everyone must take shelter. The police have designated certain heavy concrete buildings and all the underground railway stations as official shelters. Even soldiers on leave from the front are hurried into these places, for there is danger, not only from the German bombs, but from the falling shrapnel of the anti-aircraft guns. “We now hold the unquestioned superiority of the air on the western front. We have the enemy beaten in individual bravery and initiative. We have him beaten in guns—particularly machine guns, another American invention, and hand grenades; we have him beaten in food supplies, if we can oly get those supplies to England and France in sufficient quantities. The only place wherein Germany holds the upper hand is with her submarines, and that will not last forever. “In England everyone’s business is war. There is no more ‘business as usual.’ That fallacy has long since been exploded. Nearly four years they have been in it and they have given everything they possess. They have been fighting our battle, and while they are far from down-hearted, far from being ready to quit, as events on the British front in recent days well indicate, yet they are looking toward America for the final contribution that will bring the thing to a close—men, money, ships and food are needed and it is up to America to furnish them. The least we can do is to give our money. If we gave all our income and half our principal we would not be doing as much as those people have done, they are still giving. How England Floats War Bonds. In Supplement , ‘The Great War. I Was There. Undying Memories of 1914-1918’, Volume 3’. Edited by Sir John Hammerton. The Amalgamated Press Ltd., London. “NOT FORGOTTEN” is a term which we like to use in speaking of the war heroes who are still, many years afterwards, suffering from and incapacitated by their war injuries. But it is impossible for anyone to remember or realize the true extent of war’s tragedy still manifest amongst us in thousands of broken lives. Mr. Lyon’s brief marshalling of a few significant facts provides terrible evidence of the lingering misery inherited by many thousands of war veterans. Four hundred and forty-two thousand men are still living so maimed, gassed, nerve-racked, or otherwise ruined in health that they cannot work or can only work with diminished efficiency, and are partly or wholly dependent on the State for money to live. One hundred and twenty-seven thousand widows still mourn men they last saw in khaki some day in the years between 1914 and 1918. Two hundred and twenty-four thousand parents and other dependants are still suffering through the loss of sons or relatives who were their breadwinners, and have to be helped financially by the State. Only detailed figures can give an idea of the suffering that the great war is still causing today in this twentieth year of the peace. Below are given reliable estimates, made by experts, of the armies of war-injured who still form part of Britain’s population. These estimates are based on Ministry of Pensions figures, and, if the figures seem surprisingly large, remember that the less seriously injured men living today conceal their wounds as well as they can. As for the thousands of more seriously injured, they are seldom seen in the streets. These are 8,000 men with one or both legs amputated and 3,600 with one or both arms amputated, a total of nearly 12,000 men who have lost limbs. There are 90,000 men with impaired arms and legs not serious enough for, or curable by, amputation. There are 10,000 men whose eyesight has been injured by poison gas, shrapnel, bombs and shells, and of these 2,000 are blind. There are 15,000 with head injuries, many of whom still have to wear metal plates to protect them. There are 11,000 who were deafened by bursting bombs and shells and through other causes. There are 7,000 who suffer from hernia, for whom many of the active pursuits of life are impossible. There are 2,200 still suffering from frost-bite contracted in the trenches. Some of them have had limbs amputated. There are 32,000 more who suffer from various wounds not officially classed. Those are the figures for wounds. The legacy of disease that persists to this day is more terrible still. 100,000 men are afflicted with diseases too numerous to be separately classified. 41,000 suffer from chest complaints, including bronchitis and tuberculosis, brought on by the war, often as a result of gassing. 38,000 suffer still from heart disease, often brought on by unaccustomed strain and carrying too heavy weights. 28,000 suffer from rheumatism severe enough to convince the not-too-easily convinced Ministry of Pension doctors that they ought to be given disability pensions. We all know there are many more who suffer but get no pension at all. 25,000 are still suffering from nervous disorders or are neurasthenics. 3,200, their minds broken by the horrors of war, are still in asylums. A great army of doctors, nurses, masseurs, artificial limb makers, oculists and hospital staffs still work to make life a little more tolerable for the worst war wounded. There are 14,000 men whose wounds are still unhealed and who have to get medical and surgical treatment. I know of one who “celebrated” the twentieth anniversary of the end of the war by having his hand amputated as the result of a wound which has caused him almost constant suffering all these long years. There are 2,000 “twenty-years-after-men” who are still in-patients in special war victims’ hospitals, besides 1,200 out-patients. Doubtless there are many more in general hospitals. Each year thousands of pounds’ worth of apparatus and service are still needed by the wounded. Men come back to hospital year after year to have a little more cut off an amputated leg or arm. Illnesses that have continued on and off for twenty years have to be investigated anew. Each year 24,000 new surgical appliances, 4,000 new artificial arms and legs, 3,800 new artificial eyes, 25,000 bacteriological and pathological examinations by doctors and scientists are still needed to patch up shattered human bodies. And this catalogue of physical suffering and misery is not complete without remembering the economic suffering it has brought in its train. To pay pensions to the maimed and the scarred costs £40,000,000 a year, or £110,000 a day. One shilling in every pound of our national budget still goes  to keeping the war victims. The total cost to the country will eventually reach a figure which it is not easy for the ordinary man to imagine — £2,000,000,000. More than half this astronomical sum has been paid out already, but the suffering will go on for a long time yet. Now this £2,000,000,000 – which no one grudges and most people would even like to see enlarge – really represents payments to the war victims of wages for work which they or their dead breadwinners would have done had they not been killed or incapacitated. The £2,000,000,000 “wages” will be paid, but the work will never be done – and we are all poorer as a result. 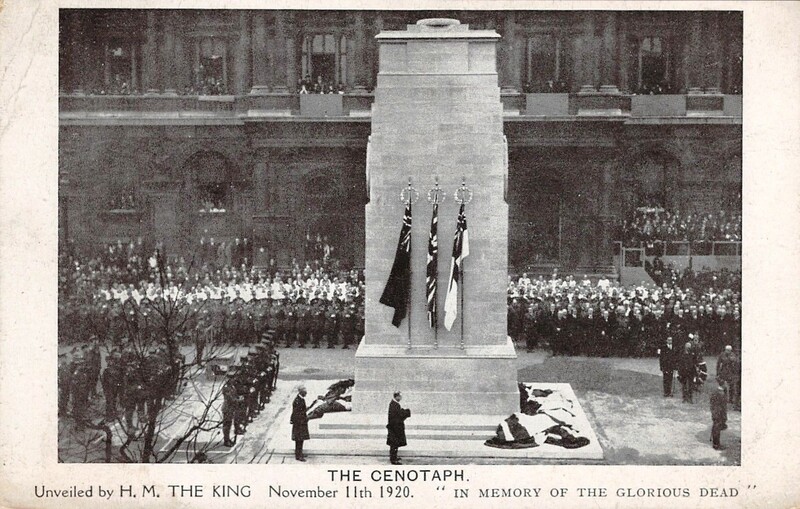 The unveiling of the Cenotaph : Armistice Day, 11 November 1920. “In Memory of the Glorious Dead”. A year after this event, Madame Guérin’s poppies adorned the Cenotaph. Courtesy of Heather Anne Johnson. Poppy Lady Madame Guérin’s French-made poppy for Great Britain’s 1921 Remembrance Day. Courtesy of Heather Anne Johnson. English Poppy : Modern/2015. Two petals + one leaf. Image courtesy/© Heather Anne Johnson. 2015 Remembrance Poppy – Scotland (left) & c2006 Remembrance Poppy – N. Ireland. Image courtesy/© Heather Anne Johnson. Poppy: ‘Blood Swept Lands And Seas of Red’, Tower of London, England. Courtesy/© of Heather Anne Johnson. ABOVE: The Poppy: the enduring remembrance emblem. One of the 888,246 red ceramic poppies from the 2014 ‘Blood Swept Lands And Seas of Red’ art installation at the Tower of London, England – created by Paul Cummins and Tom Piper. Descendants of Madame Guérin’s poppies adorn war memorials in far-flung parts of The British Commonwealth. 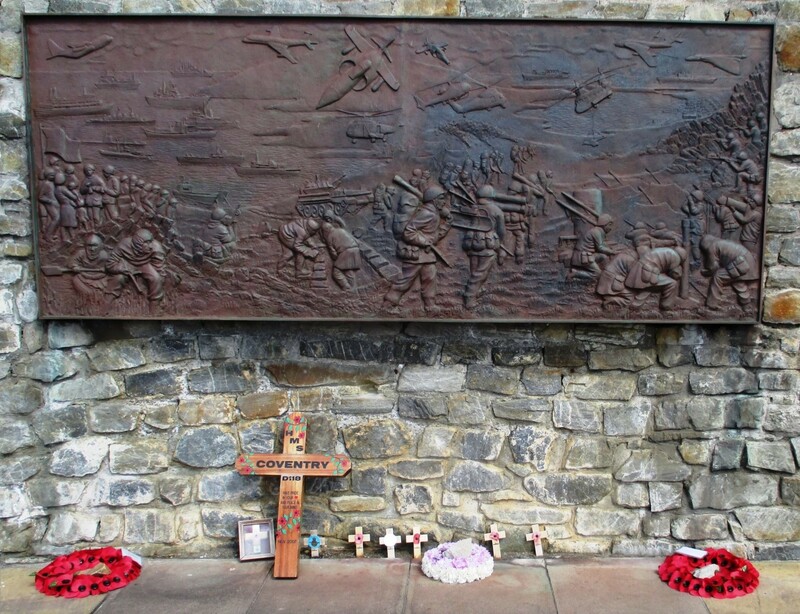 The Falklands War Memorial in Port Stanley, Falkland Islands. Courtesy/© of Mo Taylor.